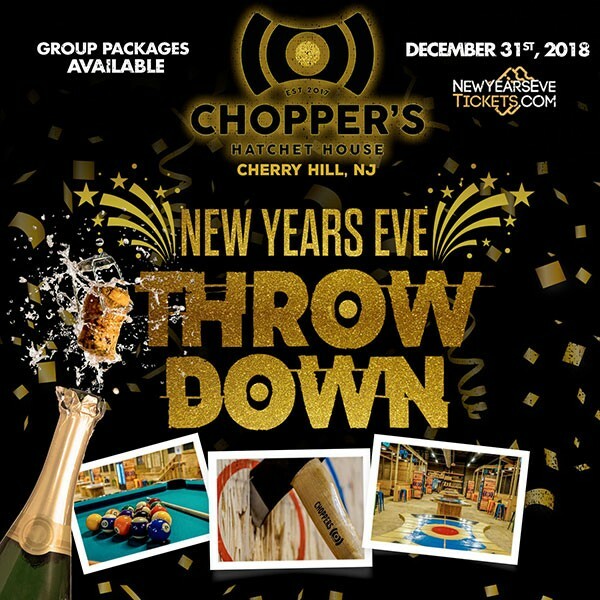 Head out to Chopper's Hatchet House in Cherry Hill for a one of a kind axe throwing New Year's Eve celebration! Throw down on multiple axe throwing stations and enjoy pool tables, video games, DJ, NYE Party Favors, and fun of all sorts to ring in 2019! Join us for a BYO NYE Party like no other! What's better than fun and games with friends on New Year's Eve? Bring your best axe throwing skills, test your accuracy, and compete against friends for bragging rights. Play a game of pool and dance away to DJ Eddie Ross spinning tunes all night long. Axe Throwing is becoming one of the most popular sports in America, and Chopper's has it all. Grab your tickets for this New Year's Eve, so you can show up to throw! BYO food - you can get deliveries from local restaurants, pizza places, etc with no issue. Your own private axe throwing arena (includes 2 lanes / targets) all night long! LIMITED to groups of 8-15 only, larger groups can get two arenas next to eachother. ** Must be 18 or older to enter. Visit https://www.choppershh.com for more info on Chopper's Hatchet House.